I know that all cheese lovers understand this. 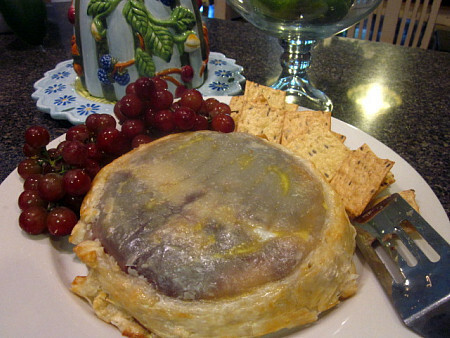 Hello, baked brie…it’s good to see you again. It’s amazing how something so simple can be so delicious. This time around, I used a raspberry red chile ginger jam (from my friend Larry, originally from New Mexico…the same friend who contributed the Walter 45), and it was divine. I’ve used so many other types of fillings before…the versatility of this dish is endless. Grab it while it’s hot – it never lasts long. Preheat oven to 425. Lightly grease cookie sheet or pie plate and place cheese on it (leave rind on). Spread preserves on top of cheese. Place puff pastry sheet on top of cheese and wrap it around the sides. Tuck the ends underneath if they reach. Bake for 20-25 minutes or until brown. Let cool for approximately 5 minutes before cutting. Serve with fruit and crackers. This entry was posted in appetizers, cheese, QuickAndEasy. Bookmark the permalink. 5 Responses to Cheese is still good. 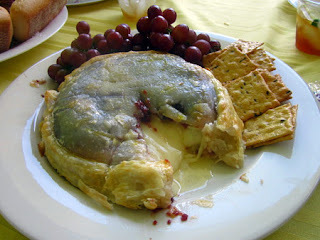 I’m pretty sure that I could eat baked brie at every meal and would be super happy. Love the sound of that jam! this is a dish you can’t sit near, because if you do, you will keep eating it til it’s gone… addictive! Yum, yum, yum. I love the idea of jam with it. Melissa I could eat that whole baked brie as it looks so good! 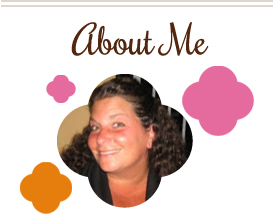 Thanks for entering my HomeGoods gift card give away!